This outstanding business is raising its cash payout to investors by 28%. The airline industry was long thought of as a place where fortunes were destroyed, rather than created. However, the industry's dynamics have shifted in recent years. Consolidation has strengthened the largest airlines, improving their cost structures and pricing power. And one major U.S airline -- Southwest (NYSE:LUV) -- represents a particularly attractive dividend investment opportunity today. Here's why. Southwest's low fares and highly regarded customer service help to differentiate it from its rivals. Additionally, disciplined cost management and a controlled approach to expansion have allowed the company to successfully navigate through periods of industry turbulence even as many competitors have descended into bankruptcy. They've also helped Southwest produce robust returns on capital and free cash flow, as well as the strongest balance sheet in the industry. Despite its tremendous success, Southwest has plenty of growth still ahead. New U.S. markets such as Hawaii provide attractive near-term expansion possibilities, while international markets represent a multi-decade growth opportunity. In fact, as my colleague Adam Levine-Weinberg notes, Southwest services just 14 international locations today, compared to more than 80 U.S. cities. In turn, CEO Gary Kelly believes Southwest could potentially add as many as 50 more international destinations to its route network over time. These expansion initiatives will likely lead to steady increases in revenue and profits, which should allow Southwest to continue to reward its investors with a rising dividend income stream. Management appears to agree; the company recently announced a 28% increase in its cash dividend payout and a new $2 billion share repurchase program. After this sizable dividend boost, Southwest's stock now yields about 1.3%. 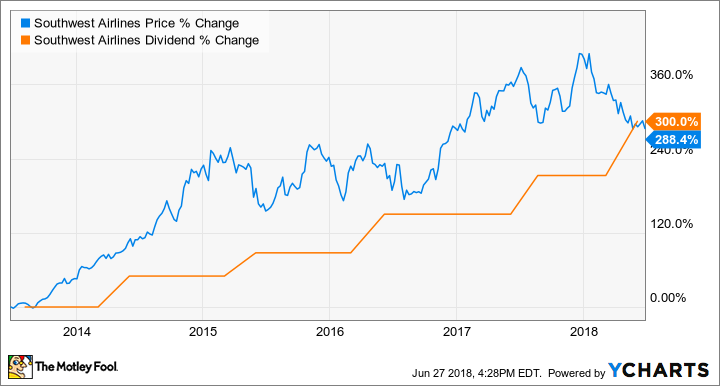 And while that may be below the S&P 500's 1.8% yield, it's largely a reflection of the outstanding performance of Southwest's stock in recent years. Better still, Southwest's stock price has pulled back along with many of its competitors on trade war fears and short-term profit concerns. But with its shares now trading for only 12 times analysts' earnings estimates for 2018 and 10 times their earnings per share (EPS) forecast for 2019, long-term investors might wish to use this sell-off as an opportunity to buy this proven winner's shares at a discount. Notably, Warren Buffett -- arguably the world's best investor -- has been accumulating large stakes in the major airlines, including Southwest. Moreover, with its low-cost fares and reputation for excellent customer service, Southwest fits well with Buffett's desire to invest in companies that sell products and services that make "people feel like kissing you instead of slapping you" -- perhaps better than any other airline. So I wouldn't be surprised if Buffett makes a bid for the company at some point in the future. But whether or not Southwest is ever acquired, investors who buy shares today should earn solid returns in the coming years.